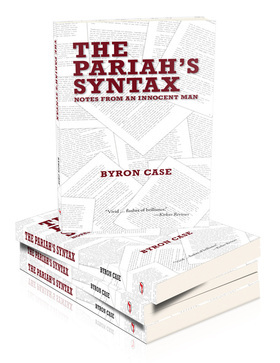 In addition to his book, The Pariah's Syntax (redbat books, 2013), Byron’s work has appeared or is forthcoming in an array of periodicals, including J Journal, Alimentum, Rockhurst Review, Meridian, I Love Bad Movies, and Hyperlexia Journal. He also contributed essays to the best-selling anthologies The Moment (Harper Perennial, 2012) and Requiem for a Paper Bag (Fireside, 2009). An eternal projectoholic, he is currently looking to publish his memoir about ostracism and the dark side of Asperger’s syndrome, while simultaneously writing a collection of interweaving stories about survivors of a civilization-ending zombie pandemic. For more information about Byron Case and his book, including reviews and an author interview, please visit the redbat books page. To learn more about his case and the campaign to overturn his conviction, click here. NOTE: Prices listed above are based on the list price + shipping and handling for one book. If you are interested in ordering more than one book at a time, please contact us at info@redbatbooks.com so we can better serve you.